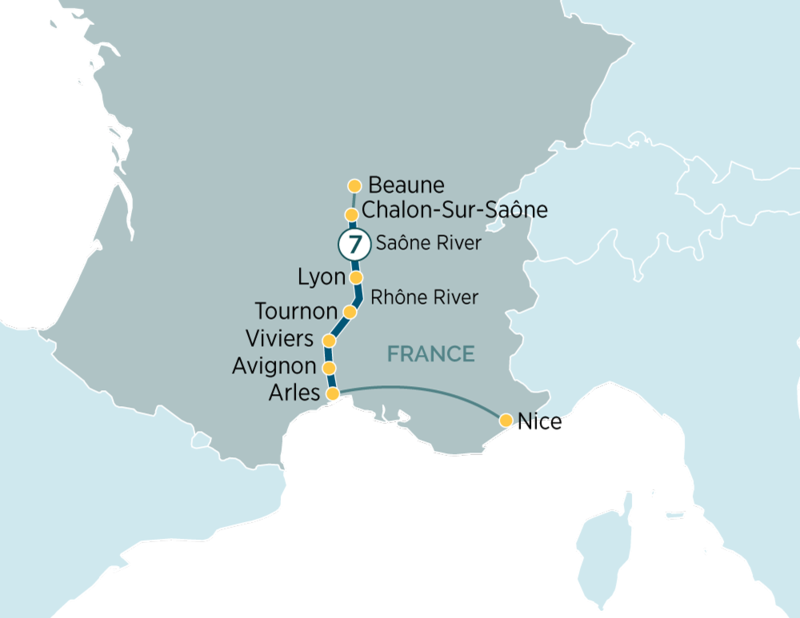 Savour the pastoral charm and history of Provence with an 8-day Rhône river cruise from Nice to Lyon. Travelling north, you’ll cut a course through lavender fields and wineries, visiting captivating destinations such as Arles, Avignon, and Chalon-Sur-Saône. After a relaxing evening on-board the Emerald Liberté, Arles is your first stop, and here you can join a guided walking tour of the city’s Romanesque architecture, including a visit to the wonderfully preserved Roman Amphitheatre. The culinary theme continues in Lyon, an ancient city recognised as the world capital of gastronomy. Take a tour of the Basilique Notre Dame de Fourviere church, before visiting a local Bouchon Lyonnais to sample the best in decadent French fare. You will be met at the airport in Nice and transferred to the Emerald Liberte Luxury ship in Arles where you will be welcomed by your Captain and crew. Tonight, enjoy a welcome reception and dinner on board.